As part of a Blog Tour organized by Great Escapes Free Virtual Book Tours, today I’m happy to tell you about Color Me Dead (Henry Park Book 1), a new cozy mystery by Teresa Trent. Artist Gabby Wolfe has the ability to see not only the beauty of the living, but the despair of the dead. When she returns to her childhood home in Henry Park, Colorado, she is forced to bring along her younger brother Mitch. He is on a “break” from college where he was majoring in wine, women and song. If that isn’t enough they also have Mitch’s rambunctious beagle Luigi along who prefers to spend his days wallowing in junk food. 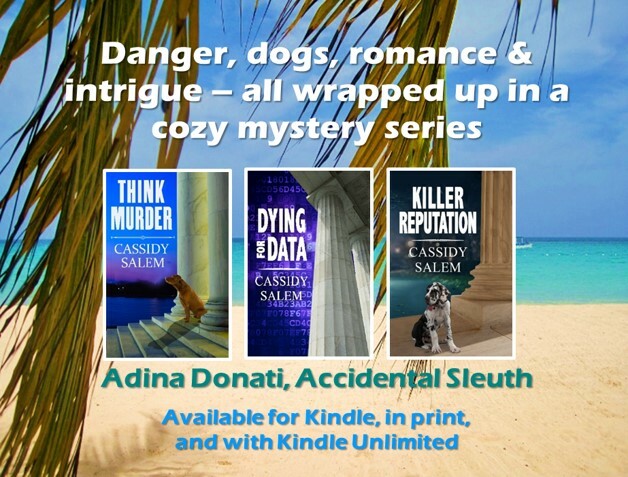 When Gabby draws the death of a young woman before it happens, she knows she must tell someone and risk a new job and her professional credibility. Will she reveal her secret in time to save the woman in the water or will it be too late? Note: For the duration of this blog tour (Jan. 23-27), Color Me Dead is free on Amazon ! Like most cozy mysteries, this was a light read. Actually, I enjoyed it more than I expected. Not usually a fan of paranormal tales, the author had this reader almost suspending disbelief and accepting Gabby and her psychic powers at face value. The mystery surrounding her vision is intricate, and the motivation and identity of the killer were far from obvious. It is easy to relate to Gabby as she rediscovers Henry Park, establishes new friendships, and embarks on a new stage in her career. A fast-paced read, I stayed up way past my bedtime to finish it.